What initially drew me to Neversink was Sam Nielson's beautiful cover. (I don't think it can be said enough how important it is to have a cover that will pull readers to a book.) Luckily for readers, there are plenty of black and white illustrations by Nielson throughout the book. They strengthen the story by giving the children (and adults) who read it a good visualization of the various animals. There is a handy guide at the beginning of the novel that shows an illustration of each of the birds mentioned in Neversink, as well as a brief description of them. I, personally, cannot tell any owls apart except for the snowy owl and was completely at a loss to what an auk looked like, so it was helpful to me. A handy map of Neversink and the surrounding area is also included in the book. As for the story itself in Neversink, I am a bit torn. I learned new things about the birds, the Artic, and the ocean, but I think all of this information took away from the story for me. There was no information dumping, so to speak, but I still had trouble getting into it. However, the mythology Wolverton created for the creatures was fascinating and imaginative. The characters themselves were cute, and their interactions were fun to read. Lockley was a bird torn between not making waves (a motto of Neversink's birds that causes them a lot of problems in Neversink) and doing what was right. He looked to his friends, Egbert the Walrus and Ruby the Hummingbird, and the Great Auk for advice and assistance when he had a problem. 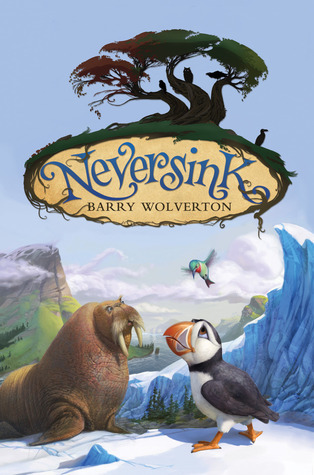 Egbert is an intelligent, and a little uppity, walrus who wants to write the history of Neversink and its stories. Ruby is a hilarious little bird who migrates to Neversink each year, and makes pop culture metaphors and references that no one understands. (This was set thousands of years ago, remember?) My favorite character would have to be Lucy, Lockley's wife. She is pregnant with their egg and is not one to let the owls completely take advantage of her. Although her cooking may have been a catalyst for Rozbell's actions, her own actions serve as a catalyst later in the book. Neversink is a novel about standing up for what is right, conservation, and the importance of friendship. This is a book that will appeal to both boys and girls who at a "middle grade" age. Young readers will learn about birds, their behavior, and environment, while enjoying the antics of the characters and a unique story. Hmmm, this sounds a bit boring. I've had such good luck with MG, and I don't think I want to risk ending that streak! It's not really boring, but I was reading Poison at the same time. Maybe that took away from my enjoyment a little?